This morning was...difficult. For a variety of reasons. And while I'm thrilled that we finally have a break from the sweltering, miserable, oppressive Louisiana heat, trying to herd two small children out the door in the pouring rain wasn't the easiest task in the world. Fortunately, I found this rockin' little tutu dress and headband for Alessandra a few weeks prior at the consignment store in Bossier City, and I was all too happy to dress principessa up this morning. I really think she's going to be a fashionista when she grows up. I mean, look at how happy she was in her little ensemble. I get to go to Mass today? YEAH!!!!! My outfit wasn't as exciting, and the picture is terrible. (Please excuse the flash and the unmade bed. As I said...it was a rough morning. And night. You may not be able to tell from the above picture, but Alessandra finally had a tooth poke through and all she wanted to do last night was nurse). 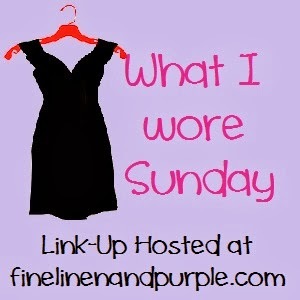 For more What I Wore Sunday, check out Fine Linen and Purple. Hope everyone has a great week! What a super cute baby! Sorry for the rough morning (and night). Hope the rest of the day is better! Your daughter is absoloutely adorable! And the top from Express is cute too! Look at that poor baby! You can see how much she misses her Nana!